I am not yet in the calm groove of summer. Actually, I doubt I will be because my kids are in the summer camp routine, which means I am still getting up early, packing lunches, eating dinner at home and trying to keep up with the constant process of washing bathing suits and towels and all things summer. So, in an effort to make life a bit easier, and not incur the cost of picking up something for lunch every day, I am utilizing what's in my fridge. You can add anything you have in your refrigerator to make this perfect for you, but make sure to add a little something special that elevates it to something you look forward to eating. I crisp up some prosciutto and add it once it has cooled to give the salad a bite of salt, and some crunch. Add leftover roasted asparagus, or steak or shrimp instead of chicken. Add beans or peas--make it your own, but don't let those leftovers go to waste this summer! Who needs Chopt?? Heat up a small skillet. Add prosciutto and cook until crispy and slightly browned. While that cools, layer your salad. 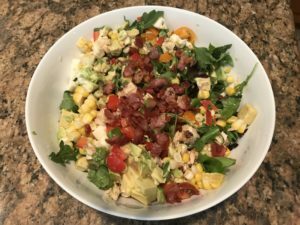 Lettuce, tomatoes, peppers, beans, corn, mozzarella, then avocado and chicken. Top with crispy prosciutto and dress with your favorite dressing, my favorite is Brianna's New American Creamy Balsamic. Happy 4th of July From A Madison Mom!